Thanksgiving Day... What Should It Mean To You? To many Americans Thanksgiving Day means sumptuous turkey dinners, family reunions and football games. Most seem to forget that the very name of this traditional holiday means to give thanks. But give thanks to whom? For what? And why? IN 1630 the little 350-ton "Arbella" was plowing westward through the rough Atlantic to the Massachusetts coast. From its deck John Winthrop preached a striking sermon that accurately predicted America's future. "Wee shall be," prophesied Winthrop, "as a Citty upon a Hill, the Eies of all people are uppon us; soe that if wee shall deale falsely with our god in this worke we have undertaken and soe cause him to withdraw his present help from us, wee shall be made a story and a by-word through the world." Those are remarkable words! They indicate that at least some of the early colonists sensed that their endeavors were being favored by the hand of God. These early settlers seemed to grasp that they were being given very special opportunities, special blessings — and special responsibilities. For all this, the indications are, some were grateful, at first. The first "Thanksgiving Day" originated with the festival held by Plymouth Colony in December 1621, in gratitude for a successful harvest. The Pilgrims from England had landed at Plymouth Rock in December 1620 and had endured a hard year. On that first "Thanksgiving Day" they thanked God they were still alive and had food to eat. Some of the Pilgrims recognized God as the source of their blessings. They held that first "Thanksgiving Day" it gratitude and praise to God. Many Americans have forgotten this. Many probably don't even think of God on Thanksgiving Day much less actually pray to Him and give thanks. For too many Americans, Thanksgiving Day has become just another holiday on which friends and family come together to glut themselves with too much food and drink. God is left out of the picture. He is not acknowledged as the source of all blessings — yet, the Bible, God's inspired Word, says, "Every good gift and every perfect gift is from above, and cometh down from the Father of lights, with whom is no variableness, neither shadow of turning" (James 1:17). Christ Himself said, speaking of God the Father, "He makes his sun to rise on the evil and on the good, and sends rain on the just and the unjust" (Matt. 5:45). Even though many may not really believe it, God is the source of their life and every good thing they enjoy. God blesses even the wicked with the basic necessities of life. From the genuine gratitude of the first Thanksgiving Day, the real meaning of this festival has gradually deteriorated throughout American history. Remember, in 1621 the first American thanksgiving was held by Plymouth colony. It was observed in gratitude for the ending of a difficult year and a bountiful harvest. The native foods — fruits and vegetables, wild turkeys, pumpkin pies and such — constituted the fare of that first thanksgiving day and became the traditional food for the day. In succeeding years, thanksgiving festivals became very popular in New England. The colonists celebrated thanksgiving days in recognition of such happy events as good harvests and victories over Indians. During the 19th century, an increasing number of states observed the day annually, each appointing its own date. As America grew, there was ever more to be thankful for. In the years that had passed since John Winthrop's prophetic sermon, America had truly become the "Citty upon a Hill." As the Civil War ended, the downtrodden masses of the world looked expectantly to America as the new land of hope and opportunity. Immigrants from many lands arrived on American shores to try to catch the American dream. Thanksgiving Day has been preserved and passed on to us by Presidents who believed in God and the Bible as the source of national greatness and integrity. George Washington in 1789 issued the first presidential thanksgiving proclamation in honor of the new Constitution. He said, "It is impossible to rightly govern the world without God and the Bible." How many Americans really believe this and give God thanks for the Bible? Sadly, most Americans don't even read the Bible. They certainly don't acknowledge it as God's inspired Word by which Presidents should rule nations. Yet God's Word says to the leaders of the nations, "And it shall be, when he sitteth upon the throne of his kingdom, that he shall write him a copy of this law in a book out of that which is before the priests the Levites: And it shall be with him, and he shall read therein all the days of his life: that he may learn to fear the Lord his God, to keep all the words of this law and these statutes, to do them" (Deut. 17:18-19). God says the king (or President) of a nation should study the laws of the Bible to be able to properly and wisely rule. Abraham Lincoln believed this. He said, "I believe the Bible is the best gift God has ever given to man. All the good from the Savior of the world is communicated to us through this book." He knew that material prosperity was bringing the problems and pitfalls that John Winthrop had so vividly foreseen. "We find ourselves," Lincoln said, "in the peaceful possession of the fairest portion of the earth, as regards fertility of soil, extent of territory, and salubrity of climate... We...find ourselves the legal inheritors of these fundamental blessings. We toiled not in the acquirement or the establishment of them." "It is the duty of nations, as well as of men, to own their dependence upon the overruling power of God... and to re cognize the sublime truth, announced in the Holy Scriptures and proven by all history, that those nations only are blessed whose God is the Lord.... We have been the recipients of the choicest blessings of heaven. We have been preserved, these many years, in peace and prosperity. We have grown in numbers, wealth and power as no other nation ever has grown; BUT WE HAVE FORGOTTEN God! We have forgotten the gracious Hand which preserved us in peace, and multiplied and enriched and strengthened us; and we have vainly imagined, in the deceitfulness of our hearts, that all these blessings were produced by some superior wisdom and virtue of our own." President Lincoln saw a nation drunk with success not due to its own efforts. He saw a nation taking all the credit and glory to itself. This great President called upon the nation for a day of fasting and prayer to confess this national sin before God. That petition was heard — and the nation was then spared. Later that same year, on October 3, Lincoln proclaimed the last Thursday of November as Thanksgiving Day — a day to give thanks to God for the multitudinous blessings He had bestowed. (Today Thanksgiving Day is observed on the fourth Thursday of November as set by Congress in December 1941). In the years that followed Lincoln, America rose to become the greatest single power, and the most wealthy nation this world has ever known. At the zenith of her power, America's six percent of the world's population possessed some 50 percent of the world's wealth. In commodity after commodity, and in product after product, America led the world. But today America is torn by strife and dissension. We have no national goal. We have recklessly squandered our fabulous wealth, and indescribably polluted our beautiful land. Greed, selfishness and ingratitude form the warp and woof of society. "Has the American Dream become the American damnation, a formula for selfishness rather than equality and excellence?" asks Time (Jan. 24, 1969). Other nations are no longer impressed with America and the way Americans do things. "Very few people are enamoured of the American way of life," says British historian Sir Denis Brogan. Historians are now speculating on whether the tenure of the U.S. as the first power in the world will not also be one of the briefest in history. What happened — and what is continuing to happen? Why is America fast losing its reputation as a "Citty upon a Hill"? Yes, we as a nation today are in serious trouble. Again, we have forgotten God and He is beginning to withdraw His blessings from us. Notice this dire warning from God: "Beware that thou forget not the Lord thy God, in not keeping his commandments, and his judgments, and his statutes, which I command thee this day: Lest when thou hast eaten and art full, and hast built goodly houses, and dwelt therein; and when thy herds and thy flocks multiply, and thy silver and thy gold is multiplied, and all that thou hast is multiplied... And thou say in thine heart, My power and the might of mine hand hath gotten me this wealth. But thou shalt remember the Lord thy God: for it is he that giveth thee power to get wealth, that he may establish his covenant which he sware unto thy fathers, as it is this day. And it shall be, if thou do at all forget the Lord thy God, and walk after other gods, and serve them, and worship them, I testify against you this day that ye shall surely perish" (Deut. 8:11-13, 17-19). God spoke this prophecy to ancient Israel, but it applies today to modern America. God says to America (or any nation): "But it shall come to pass, if thou wilt not hearken unto the voice of the Lord thy God, to observe to do all his commandments and his statutes which I command thee this day; that all these curses shall come upon thee, and overtake thee: Cursed shalt thou be in the city, and cursed shalt thou be in the field, cursed shall be thy basket and thy store. Cursed shall be the fruit of thy body, and the fruit of thy land, the increase of thy kine, and the flocks of thy sheep. Cursed shalt thou be when thou comest in, and cursed shalt thou be when thou goest out. The Lord shall send upon thee cursing, vexation, and rebuke, in all that thou sertest thine hand unto for to do, until thou be destroyed, and until thou perish quickly; because of the wickedness of thy doings, whereby thou hast forsaken me" (Deut. 28:15-20). What does all this mean — and what does it have to do with Thanksgiving? Just this: our careless, godless, decadent way of life has stripped the value and meaning from the Thanksgiving Day holiday. There is nothing necessarily wrong with good food and family reunions on Thanksgiving Day. But all too many use these activities wrongly and forget the purpose for the holiday. Many glut themselves with far more food than they ought to eat; few, however, stop to give God thanks for this food — even on Thanksgiving Day. Family reunions all too often turn out to be family brawls. Many a tense Thanksgiving Day with relatives ends in violence. And in recent years, there have been several cases of someone jumping up from the Thanksgiving dinner to grab a gun and shoot some member of his or her family. Millions of others push and shove one another in large crowds at football games and parades, and kill one another on the highway as they madly strive to make sure they get their fair quota of pleasure. And where is the giving of thanks in all this? In the overwhelming vast majority of the cases, it is nowhere to be found. What a travesty! As we observe Thanksgiving Day this year, we need to stop and soberly reflect on why we have so much, why we are losing it so fast, and where we are headed. As perhaps no other literature you might read, our free book on The United States and British Commonwealth in Prophecy will help you do this. But Thanksgiving is not just for Americans and should not be limited to one day a year. It should be a daily occurrence for all of us. We all have much to be thankful for — all the time. Now as never before, we need to stop and thank God for the many blessings we still have — and change from our wrong ways so that the blessings we have lost can be restored. If we fail to do this, and if we fail to acknowledge God as the Giver of all our blessings, He will surely "withdrawe his present help from us, [and] we shall be made a story and a by-word through the world." 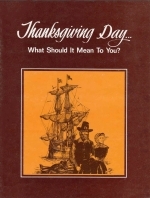 HOW does God view the American custom of celebrating Thanksgiving Day? The Thanksgiving holiday was established in comparatively recent years. It is not mentioned in biblical revelation but the principle of attending and celebrating national holidays is made clear in Scripture. Thanksgiving Day was established by the early colonists, not by any divine authority. But this in itself does not make it wrong to celebrate. Notice the example of Jesus Christ. In John 10:22 we find that Christ attended the "Feast of Dedication," which was established by the Jews years before to commemorate the purification of the Temple at Jerusalem. That day was celebrated on the anniversary of the day that the reestablishment of divine worship occurred after Antiochus Epiphanes had been vanquished and the Temple purified about 165 B.C. Jesus' attendance at that annual holiday clearly illustrated that it is good and right to attend or celebrate a national holiday established for an honorable purpose. There was nothing wrong in the Jews' celebrating the dedication of the Temple and giving God special gratitude on that day. God led Esther and Mordecai to establish the Feast of Purim in commemoration of the miraculous deliverance of the Jewish people from bloody Haman (see the last chapter of Esther). The national holidays celebrated by the Jewish people have, of course, no special significance for the non-Jew — just as Thanksgiving Day holds no special significance for non-Americans. Finally, the American Thanksgiving Day does not have a pagan origin, despite the claims of certain sects. It is not usually celebrated with pagan ceremonial customs in honor of pagan traditions and gods, as are Christmas, Easter and Halloween.